7.1 Surround Sound The G35 is powered by second-generation Dolby Headphone technology that processes 7.1 surround sound, so you can hear your music, movies and games the way developers intended them to be. Hear and be Heard Clearly With an ear-enclosing design, the G35 reduces annoying ambient noise from interfering with your entertainment, while an adjustable, noise-canceling microphone focuses on your voice and reduces background noise for clear, intelligible voice commands. The rotating microphone boom swings out of the way and mutes the mic without you touching anything. Maximum Comfort The G35 comes with three swappable headbands so you can select the style that fits your head best. Real-time Voice Morphing With the included software, change the pitch and timbre of your voice using one of six presets that can morph your voice to a Troll, Mutant, Alien, Giant, Cyborg, or Space Squirrel. Quick Access Audio Controls The G35 features three customizable G-keys on the left earpiece for one-touch command over voice morphing. Additional on-ear audio controls provide quick access to volume, microphone mute and surround sound adjustments. USB Connection The G35 features a USB connector for the ultimate plug-and-play convenience. Just connect the headset to your computer and you are ready to go! Pros: Not sure why people are down voting this headset, but for me it works awesome and I still am using it till this day! Bought it in 2013. Cons: Replaced the ear pads because the leather started cracking off the headset this year. I ordered a pair of replacement cloth pads they work better, and make the headset look better than when I bought it new! Other Thoughts: I'm going to assume people treat their headsets like s***, and toss them around because with normal use this headset won't break. Pros: The sound quality is great and the surround sound feature makes a huge difference in gaming. They are very long lasting, as I've been using mine for 7 years. Cons: The biggest con is that the ear pads absolutely will wear out. I have easily found replacement ear pads for very cheap, but it is annoying that the 3rd party ear pads are better quality than the ones it comes with. The headset is rather heavy and weighted on the head band. It's noticeable after prolonged use. Other Thoughts: It's definitely a great headset overall, but I think next time I'll be looking for something a little more comfortable and lighter weight. Pros: As the title states this is not a wireless headset. There's no battery and no "turning off." I've had this headset for 9 years! I bought it when it was $99. This thing has been unbreakable in it's ability to withstand falls, kicks, and the wire being rolled over for years! 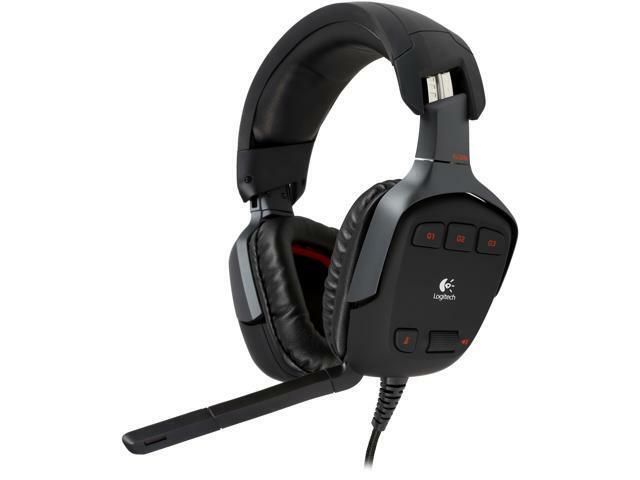 You don't need any software to use this headset and it works amazing on PC, PS3, PS4, and XBOX ONE. Cons: It's heavy(sturdy) and may cause a pressure point pain, at the top of your head where the band sits, after a few hours. There are plenty of cushions to swap out on the headband to alleviate this. Don't but these at $200+ Ever. There are other's at a comparable price as that or lower that are just as great. Cons: -Extremely Fragile, it dropped on carpet from only 3ft and broke like it was made of thin glass. -Overpriced now, I bought my previous headsets at 79 bucks. I'm sure you can get a better headset at the price they are lookin for now. Pros: Comfortable, sounds great, works perfectly with the Logitech desktop app. Cons: Bulky compared to my previous headphones. I'm careful with these things when moving them around because I'm a little suspicious of the durability. Other Thoughts: I didn't do my homework and bought these things thinking they were the top of the line Logitech headphone. In hindsight I wish I had bought the G633 set instead. Pros: Excellent sound quality and comfort. The software works perfectly with my Logitech G19 keyboard and my G600 mouse. It so good that I am on my 3rd one ! Cons: Why am I on my 3rd one? Because they are built like garbage. Flimsy construction. A small crack begins over the earphone and eventually it gets bigger and then the whole unit falls apart. My current one has a crack developing now and it will also fail. When that happens I plan to buy something a bit more robust. Other Thoughts: Too bad it is built like garbage because it is a good headset and works seamlessly with my other Logitech peripherals. -durable ear cushions for greasy people like me. -good clear mic sound and taking to my friends by discord. Cons: -ear cushions may not be as comfy as my previous Razer kraken 7.1 ( it was much thicker and fluffier ), though it wont itch and heat your ears after excessive usage. -for big heads the headband may seem stiff and uncomfortable, but after usage it should stretch a little bit. Other Thoughts: this is a special case for me, but be warned glasses users, the ear cushions hurts like crazy because it sits on my glasses arms, so unless you have thin and light glasses you wont suffer as much, just try wiggling your headset till you find the sweet spot.